With an official 100 year birthday right around the corner, there is so much to celebrate in Zephyrhills! One of our goals in Countdown is to capture a few glimpses of unique components of our town’s culture! With no disregard for the rich economic and political annals of olden times, we find that accounts of everyday happenings sometimes capture the spirit of the times. Many of the ZHS alumni who shared stories from their high school experiences, conveyed anecdotes from particularly the 1950’s through 1970’s. They mentioned the Freezette or the Biff Burger. Have you noticed that memories may be connected with the taste palate? Does the thought of a broiled burger smothered with special sauce, a curled biff dog, and an orange fountain transport you back to a more carefree era? Well, read on! In Zephyrhills, the Freez-Ette was located at 5841 Gall Boulevard where Mari’s Donut shop is now located. The owners of the Freezette were Mabel & Louis Loysch. Their children are graduates of Zephyrhills High School. Their son, Louie Loysch, is a member of the Class of 1954 and currently works for the City of Zephyrhills. Their daughter, Linda (Loysch) Trottier of Plant City, is a graduate from the Class of 1963. Does anyone have any pictures of the Freezette they would like to share? 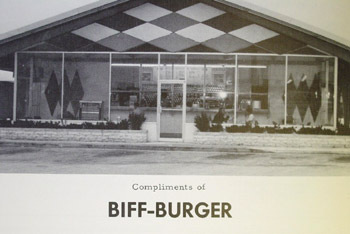 The Biff Burger was located at 5963 Gall Blvd. [HWY 301 & Gieger Road, Zephyr Plaza] where ABC Pizza is now located. These restaurants were the forerunners of the fast food restaurants that occupy Zephyrhills today. 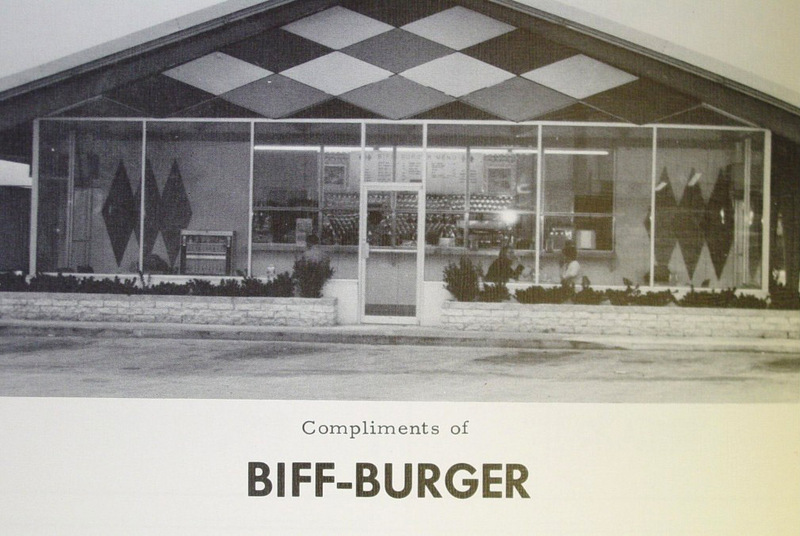 After a football game, a trip to Biff Burger was in store. For your convenience, this recipe has been scaled down from that which was made in large quantities in 5 gallon buckets at the drive-ins. So why reminisce about these culinary establishments? Well, perhaps they represent an era of “Happy Days,” when the rock and roll generation began to come of age at ZHS. Similar to the popular television sitcom which featured this decade, Happy Days, there was a real sense of optimism. In regard to cheerfulness, the motto of the class of 1950 was “Not At The Top—But Climbing” and 1956-“As Tomorrow Dawns.” The school annual, Zephilsco, instituted the annual ritual of crowning the king and queen of the yearbook in a renowned surprise ceremony. Examples of the yearbook royalty were: 1958—Felton Howard and Margaret Nelson; 1957—LeNore Lincoln and Paul Canady; 1956—Sarah Peck and Lamar Massey. The class of 1950 was excited to resurrect the annual ZHS alumni reunion as an opportunity for ZHS alumni and friends to get-together and reminisce about their experiences. Other significant institutions during this decade include the PTA. In 1955, the PTA put out a decree to the area parents to attend the regular meetings. They presented monthly sessions and entertainment. Jean Murphy, a well-known community member/teacher often sang solos for the events. In 1954, the PTA hosted a special tea for the faculty and announced a membership goal of 500 parents for the year. The curriculum innovations were in great part, parent-driven. Also significant as an institution was the Future Farmers Association (FFA) for boys. Nathan Geiger was an officer for several years, and not only did ZHS do quite well in the county tractor driving competitions, they also won many awards in the guitar-picking, band competitions for FFA boys as well. The Zephyrhills News instituted a weekly student-written column entitled “School Daze,” and a budding journalism student reported on weekly events at the high school and often editorialized on happenings. Some were Shirley Dixon in 1954 and Margie Braden in 1958. We are so delighted that this institution was re-established in 2009 by Danny Linville. Sports continued to thrive. The ZHS baseball park was dedicated in 1957. In 1952, ZHS moved into first place in the West Coast Conference in baseball. The quarterback club that was formed in 1941, boasted a membership of 100 in 1956 and worked on funding bleachers and lighting for Krusen Field which had been dedicated a few years earlier. They also began the institution of taking the football players on an annual trip to see the University of Florida play a football game in Gainesville—quite a treat for the boys! Students from this decade report that it snowed in Zephyrhills in 1957 and students were permitted to frolic in the schoolyard in the newly fallen and unusual snow of that winter. Graduations during the decade were almost exclusively held at the Home Theater, that is the movie theater on Fifth Avenue in downtown Zephyrhills. The 1959 graduation at the end of the decade ended the tradition by being hosted at the brand new Zephyrhills Municipal Auditorium. For example in 1958 the News reported that “following commencement exercises at the Home Theater last evening, Mrs. Robert Campbell, as general chairman of the party, plans for a dance at the American Legion Hall, immediately following graduation, a midnight show at the Home Theater, a swim party in the municipal pool and breakfast at the Veterans of Foreign Wars Hall.” It was most definitely happy days for ZHS. Copyright © 2010 Zephyrhills100.com. All rights reserved.